Title-text: I just caught myself idly trying to work out what that resistor mass would actually be, and realized I had self-nerd-sniped. I'm NOT going to analyze this . . . must resist . . .
Look at me, still talking when there's Science to do. ...I think this one deserves my first "meh." Just a bunch of half-assed "I've taken circuit design" in-jokes illogically strung together. Anyone who laughs at the 666 timer is a nerd. sometimes xkcd lowers my self-esteem, as comics like this are so esoteric, i feel completely out of the loop and uneducated. The answer is that the circuit bursts into flames because there's a 50V source with both sides connected to ground. EDIT: And some AC sources with the ends hooked together. Anyone who gets the arena joke is definitely a nerd. Last edited by Doodle77 on Wed Apr 21, 2010 4:06 am UTC, edited 2 times in total. Most of the diagram is quite bizarre but I definitely lol'd at the title-text. 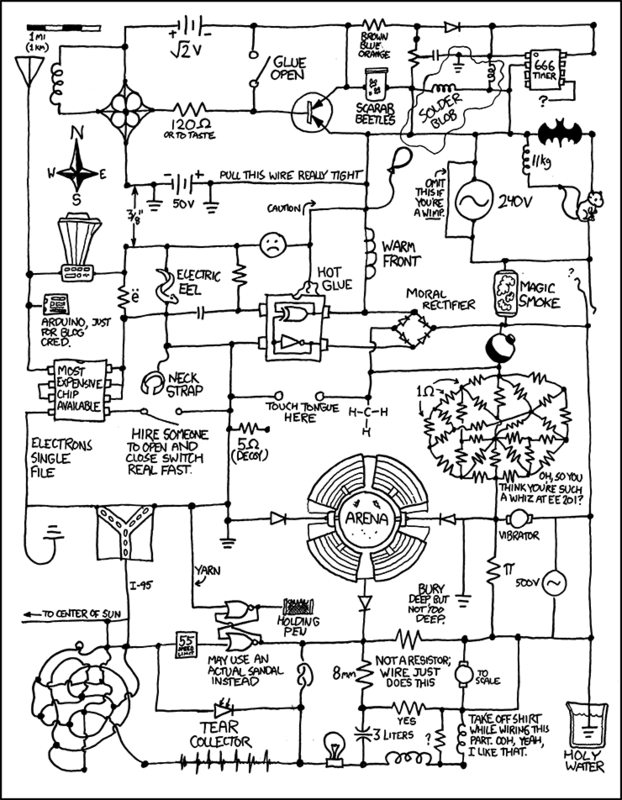 I remember just enough about schematics from my Scouting/Radio Shack days to be giggling all through this. helo darqness wrote: sometimes xkcd lowers my self-esteem, as comics like this are so esoteric, i feel completely out of the loop and uneducated. It's not supposed to mean anything; it's just a fake circuit design made out of nonsense. Basically it's the electrical engineering equivalent of this little beauty. Doodle77 wrote: The answer is that the circuit bursts into flames because there's a 50V source with both sides connected to ground. Doodle77 wrote: Anyone who gets the arena joke is definitely a nerd. I still got distracted that the blender was neither a Vitamix nor a Blendtec and also had no handle (how annoying to try and use one that way). When that happens to me I feel the need to Google and Wikipedia enough information until I understand the jokes. I like it because I find myself getting smarter as a result. It may be hard with this one since pictures are hard to Google. Obviously, this circuit would never work without I-95 South eventually turning into 93 North. Please don't over-analyze the hilarious out of this. This goes in my top ten for sure. jspenguin wrote: Anyone who laughs at the 666 timer is a nerd. And a 240 VAC source connected to itself and the ground-side of the 50 VDC supply and the... I'll stop. Clearly I know more about music than circuit diagrams because I lol'd at this link. I'm glad randal puts little things in to make the non-nerds laugh. My friend says "false there is a wire going to the sun, its not a closed curcuit, so it does nothing"
Damn, just nerd sniped me. Music style. Tron. Or at least that's what I got. Magus wrote: If history is to change, let it change. If the world is to be destroyed, so be it. If my fate is to die, I must simply laugh. Just as you touch the energy of every life form you meet, so, too, will will their energy strengthen you. I'm just disappointed that there no were no references to a not gate as the ship from Asteroids. Does anyone know what the symbol with the circle and the squiggly line represents? That's not an aspect of a circuit diagram that I recognize and I can't find anything that looks like that in a quick Google search. There are at least two of them in the diagram, one next to the "omit this if you're a wimp" note and another next to the Pi ohm resistor. Also, while we're on the subject cool random fact: that I've heard by word of mouth but never seen in a reliable source. Although the terminology goes diode, triode, tetrode, pentode, originally diodes were not called that because they had two wires going in but rather from "dia" and "ode" from the Greek for "through path." (I suspect this is true because the diode term was used long before there were triodes). I wonder if this circuit can really put 1.21 gigawatts through that flux capacitor there. JoshuaZ wrote: Does anyone know what the symbol with the circle and the squiggly line represents? That's not an aspect of a circuit diagram that I recognize and I can't find anything that looks like that in a quick Google search. There are at least two of them in the diagram, one next to the "omit this if you're a wimp" note and another next to the Pi ohm resistor. AHAHAHA! The creation of this comic doesn't have anything to do with the fact it was 420 does it? ^_~ I absolutely love it! Location: Orbiting this neat-o star called "Sol"
I've never taken Physics E&M, but I do know some of the symbols that pop up in the diagrams. That may be why my favorite part of the diagram is "Not a resistor; wire just does this." Actually the magic smoke looks more like raw bud. If the male mind truly were a machine it would consist of a shaft and a bushing. Yeah, that's EXACTLY what I thought too. What an amazing comic. Notice the directions of the three surrounding diodes, then watch http://www.youtube.com/watch?v=pmRAiUPdRjk. JoshuaZ wrote: Does anyone know what the symbol with the circle and the squiggly line represents? At first I was thinking it might be like a circuit-diagram representation of Randall's personality/mind or something, but then I scrolled down and realized that it's waaaaay too random for that! The thing I most identified with here was the "Arduino, for blog cred" bit. Last edited by MrCode on Wed Apr 21, 2010 4:29 am UTC, edited 1 time in total. The lack of a particular observation galled me so much that I created an account to post it. Why is there a North, Five, East and West sign? Where's south? Why is there a balloon? So many questions. I admit I liked the moral rectifier. memcginn wrote: I've never taken Physics E&M, but I do know some of the symbols that pop up in the diagrams. No. It may help to note that there are two diodes allowing current to go into the arena, but only one allowing it to leave. I've let the "Magic Smoke" out of too many items. And it's tough to get it back in. Anyone figured out the equivalent resistance of the crazy mess of resistors? should be pretty simple after a couple Delta-Y transforms. I'll probably work it out on the train tomorrow. I thought it was a reference to the coliseum. I also noticed this whole thing looks like it's designed to power a light bulb. Randall needs to play some gizmo's and gadgets, because this circuit isn't a bright idea. Last edited by Quicksilver on Wed Apr 21, 2010 4:33 am UTC, edited 1 time in total.